This interesting book combines colorful illustrations and photos with tid-bits of weird information about history, science, biology, culture, animal life, and a million other subjects! I read through the entire book in just a half hour, fascinated with every wacky statement and attracted to each page by the stunning photos. 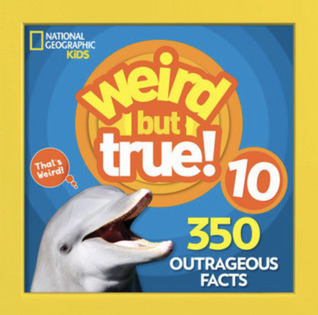 I learned so many freaky things, like that jellyfish used to have hard shells, there is an albino humpback whale off the coast of Australia, and that it’s against the law in the USA for donkeys to sleep in bathtubs! haha! Weird and random and hilarious! I only wish that each little fact had had a bit more information. Some of the factoids needed more explanation, and it was unclear what the results or implications of the fact would be. It left me scratching my head, and wondering what was meant. I suppose this could be a catalyst for kids to do a little research on their own and find some answers, but it annoyed me not to have all the information. This would be the perfect book to read with a child or teen. It would spark their imagination and get them curious about the world!